How about a round of applause for Seattle? This spring, a group of activists calling themselves “Reasonably Polite Seattleites” installed a protected bike lane on Cherry Street. How did Seattle officials react? Well, this week the city made it permanent. To recap, the anonymous group installed the pylons under the cover of night this spring. They then sent an email to Seattle Bike Blog and SDOT explaining why they did it and pointing out the fact that they used a simple adhesive to make them easy to remove should SDOT choose to do so. In many other cities, such acts are met with scorn and threats of legal action from city officials. But Seattle’s Traffic Engineer Dongho Chang did not. Instead, he wrote an equally polite email back apologizing for the fact that they needed to remove the pylons, but thanking the group for making a statement about road safety. Well, now Chang and the city have gone a step further. They have installed permanent pylons with safe clearance space for bike handlebars and extra buffer space on the roadway. 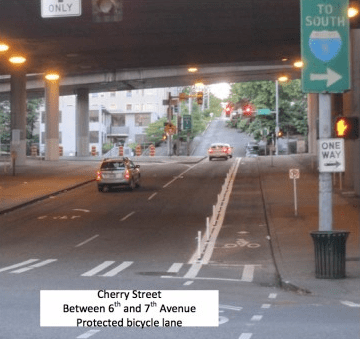 They also completed a safer connection to First Hill by installing a bike lane on 7th Ave between Cherry St and Marion, which is a signed bike route across First Hill that will soon connect to the Broadway Bikeway when it is completed. Chang even wrote a friendly letter to the “Reasonably Polite Seattleites” saying, “I have good news to share. SDOT worked with WSDOT to reinstall your thoughtful protector treatment on Cherry Street.” Confirmed: Coolest traffic engineer ever. Elsewhere on the Network today: The Raleigh Connoisseur shows off the city’s impressive new parklets. Urban Indy explains how arterial roadways divide city neighborhoods. And Greater Greater Washington reports that while D.C. works to make streets more walkable and less highway-like, Virginia is endeavoring to do just the opposite.